Male/Female, 21 to 35 years old; Must be a graduate of BS in Accountancy; CPA designation is an advantage; With at least 3 years of similar or related experience; Has good English communication skills; Can work under limited supervision; Can start ASAP. Male/Female, 21 to 28 years old; Must be a graduate of BS in Psychology or Management; Preferably with at least 1 year experience in recruitment; Has good active listening, reading comprehension and negotiation skills; Has sound decision-making, time management and critical thinking skills. Male, 21 to 28 years old; Graduate of any 4-year courses, preferably engineering-related; With Basic Occupational Safety and Health training certificate; Preferably with at least 2 years of experience as a Safety Officer in a manufacturing company; Has good leadership and communication skills; Has exceptional coordinating skills; Must be computer literate. Female, 21 to 30 years old; Graduate of any 4-year business courses; With at least 6 months to 1 year of cashiering experience, preferably in retail operations. Male/Female; Graduate of BS in Management/ Marketing or other 4-year business courses; With at least 1 to 2 years of experience in similar role, preferably in a retail or food industry; Has good management skills; Must be dynamic, innovative and results-oriented. Candidate must possess a bachelor’s/college degree relevant to Information Technology or its equivalent; With experience in similar role. 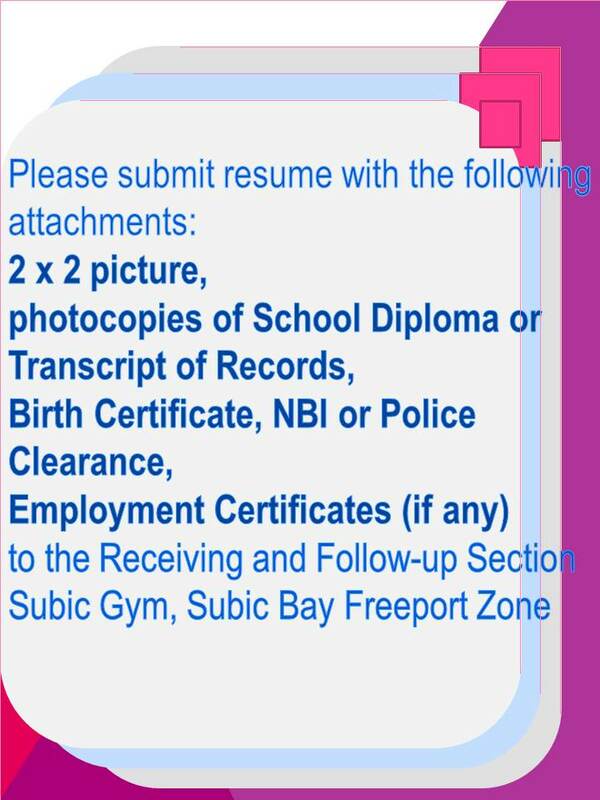 SUBIC LANGUAGE LEARNING CENTER, INC. Candidate must be 21 to 35 years old; Must be a holder of a bachelor’s degree in Accountancy/ Banking & Finance or equivalent; With at least 1 year of experience in similar role; With pleasing and outstanding personality. Male, 20 to 27 years old; At least college level; With at least 1 year experience in similar job. GRAND PILLAR INTERNATIONAL DEVELOPMENT, INC.
Male/Female, not more than 29 years old; With pleasing personality; Must be at least college level or with vocational diploma/ short-course certificate relevant to Food and Beverage Services or equivalent; With at least 1 year of experience in similar role; Has good communication skills. TRANSLIFT PORT EQUIPMENT SERVICES, INC. Candidate must be a graduate of BS in Civil Engineering; Must be knowledgeable of steel building modification and construction. Male/Female; Must be a Registered Medical Technologist, with PRC license; With or without experience; Must be willing to undergo training. Female; Must be a Registered Nurse, with PRC license; With or without experience; Must be willing to undergo training.